The range of engineered nanoparticles (NPs) designed as specific carriers for biomedical applications, e.g. cell targeting and drug delivery, is still on the raise and the question on how NPs are interacting with single cells and sub-cellular structures remains important. The delivery to the cell surface as well as the interaction of NPs with cellular structures with possible subsequent response is highly influenced by various parameters such as (a) the physico-chemical properties of the NPs, (b) the cell and tissue type and (c) the intracellular fate of the NPs in the various organelles including biopersistence, exocytosis and/or transfer to other cells. 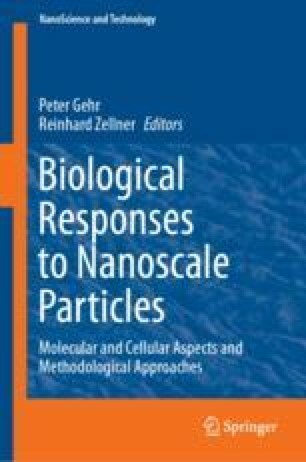 The aim of this book chapter is to discuss, on the basis of existing literature, the interaction of NPs with single cells including the intracellular fate and their interference with signaling pathways. We would like to acknowledge the Swiss National Science Foundation (310030_159847/1), the National Center of Competence in Research for Bio-Inspired Materials and the Adolphe Merkle Foundation for financial support. We kindly thank Dr. Miguel Spuch Calvar for the graphical design.